Before we moved this past June, I was beginning to think the idea of neighbors who came bearing welcome casseroles when you moved in and popped by to borrow cups of sugar was a fiction. It’s not like we’ve ever had any true horror stories or anything pilfered from us (although I never did get my office gift basket last Christmas, just sayin’) but for the most part, our former neighbors have just been distantly polite, a little gruff, or mysteriously absent. And then we moved to this building! It’s like a weird and wonderful little haven of neighborliness. In the summer we came home to neighbors sitting on the front stoop with their kids; on Halloween the owners put out baskets of candy. We have brunches and baby showers, read-a-thon sponsor sign-up sheets and holiday decorations (right now, an impressively life-size sled). I can’t say we minded comfortable anonymity (’cause it’s a-okay if I never meet the people who bear witness to my unhealthy dependence on Amazon Prime) but guys … neighbor brunches. When the travel time is about 10 seconds, shoes are optional, and I can practice my quiche skills, I can get down with that. Predictably, one of the best things about actually knowing my neighbors is having an outlet for (or an excuse to bake more of!) all the baked goods I turn out of my kitchen. These Linzer cookies were my contribution to a building shindig a few weeks ago. 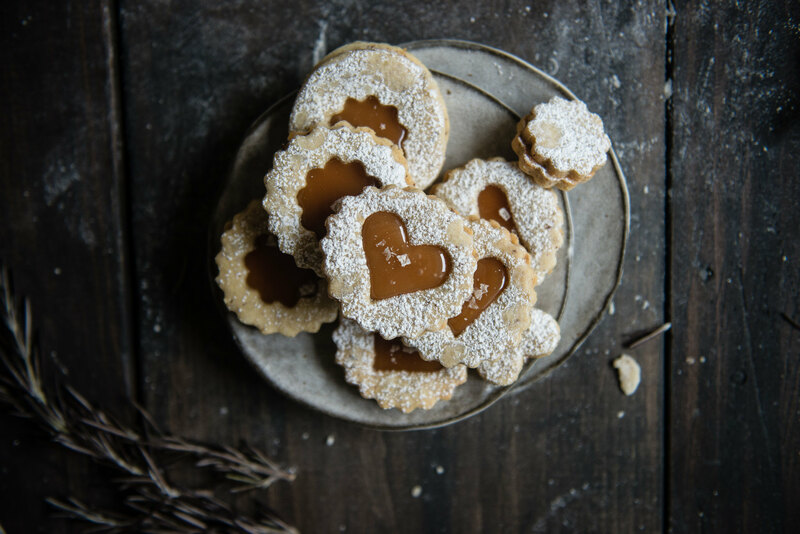 With salted caramel filling instead of jam, they’re a little bit of a cross between alfajores and traditional Linzers. The rosemary adds a hint of something extra to the mellow nuttiness of the shortbread, and the salted caramel is a warm, soothing accompaniment that I thought was a nice alternative to jam. I’ve been obsessed with pairing rosemary with caramel lately — I just made rosemary-caramel corn over the weekend, too, and something about that savory herbal note just makes the caramel that much more addictive. All in all, these were just what I was looking for in my holiday baking — fun to put together (with an excuse to shake powdered sugar everywhere), festive, buttery, and satisfying, with a few of my favorite wintry flavors. Sneh’s chocolate bomba with tiramisu cream look so dreamy and festive. The most elegant weeknight holiday party. Sini’s holiday wreaths and gorgeous saffron buns make me want to spend Christmas in Finland. This entire post — more wreaths, the most beautiful table setting (can I have this for my wedding?!) and a pear and pine (!) winter salad. Molly’s gingerbread terrariums were beyond genius already, but look at this gingerbread farm!! A stunning cranberry and candied rosemary winter pavlova. Alana’s 12 Days of Holiday Cookies stole all of my words and ability to not type in caps-lock. The packaging, the cookies, SO AMAZING. These gingerbread surprise beignets with mocha hot chocolate are the holiday season incarnate. And I’m thinking these gingerbread-cardamom waffle sticks (!) would make the perfect Christmas breakfast. Hope you’re all having a lovely holiday season so far! And P.S. 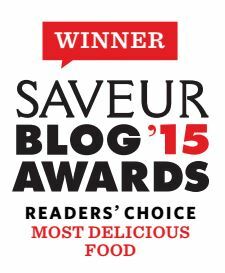 don’t forget to enter last week’s Staub giveaway — it ends tonight! 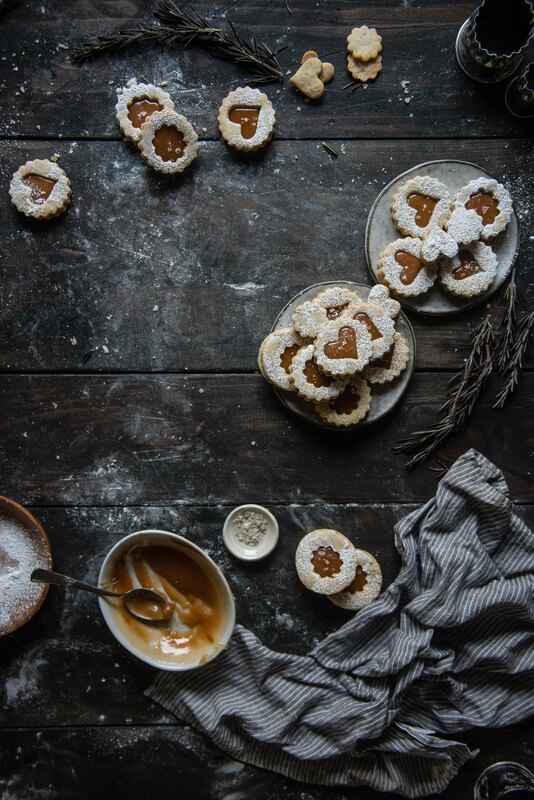 Rosemary + salted caramel Linzer cookies. Whisk together the hazelnut flour, all-purpose flour, baking powder, and salt in a medium bowl. Combine butter and sugars in a large bowl and beat vigorously until light and fluffy, about 2 to 3 minutes. Add the egg and chopped rosemary, then beat again until well-blended, another 30 seconds. Finally, fold in the flour mixture until just incorporated. Divide dough into two or three balls, pat them into discs, and wrap each in plastic wrap. Chill the dough in the fridge for at least 1 hour and up to 2 days. Heat oven to 350°F. Line two baking sheets with parchment paper or silicone baking mats. Roll out a disc of dough to about 1/8- or 1/4-inch thick, depending on your preference. Unlike pie crusts, which I generally roll out between sheets of parchment, I found this to be easiest on a well-floured surface, sprinkling flour over the top and lifting the bottom to re-flour as needed. 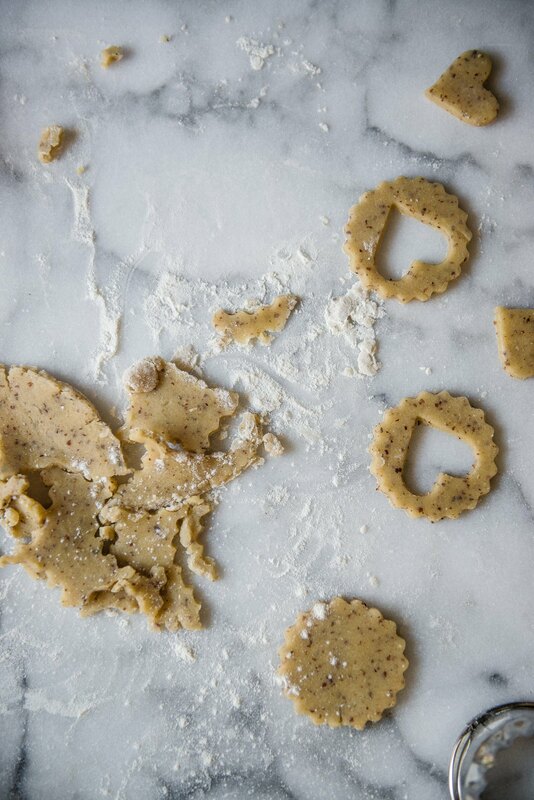 (The latter makes cutting and removing the cookie rounds much easier.) Cut out cookie rounds using a 2-inch cookie cutter of your choice. For half the rounds, use a smaller cookie cutter (around 3/4 inch) to cut patterned holes -- these are the windows for the cookie "lids." Save the minis to make miniature cookie sandwiches (or just to nosh!) If the dough becomes too soft as you’re using it, just pop it into the freezer for a few minutes to firm it up again. Place the "lids" and cookie holes on one baking sheet and the whole cookies on another, since the whole cookies may take a little longer to bake. Bake both sheets of cookies until golden at the edges, about 10 minutes for the bottoms and 8-9 for the lids. Cool on baking sheets for a few minutes, then transfer to a wire rack to finish cooling. 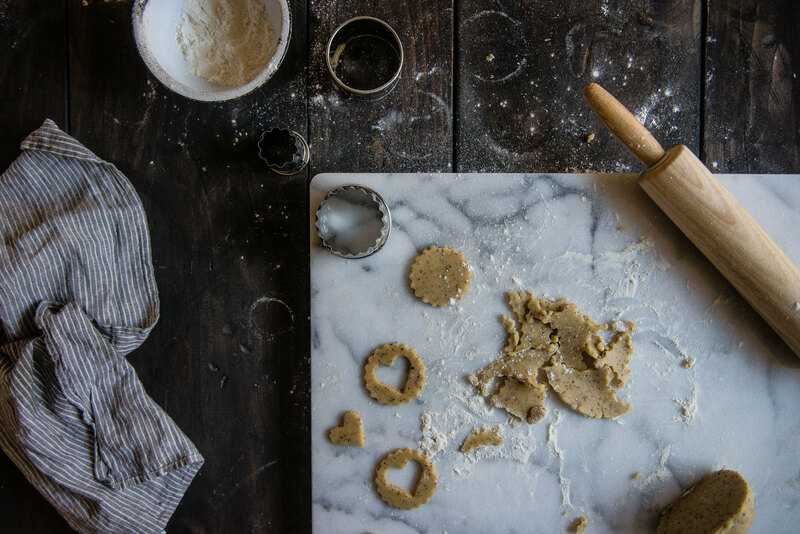 Repeat with remaining dough; you can re-chill and re-roll cookie scraps as many times as needed. 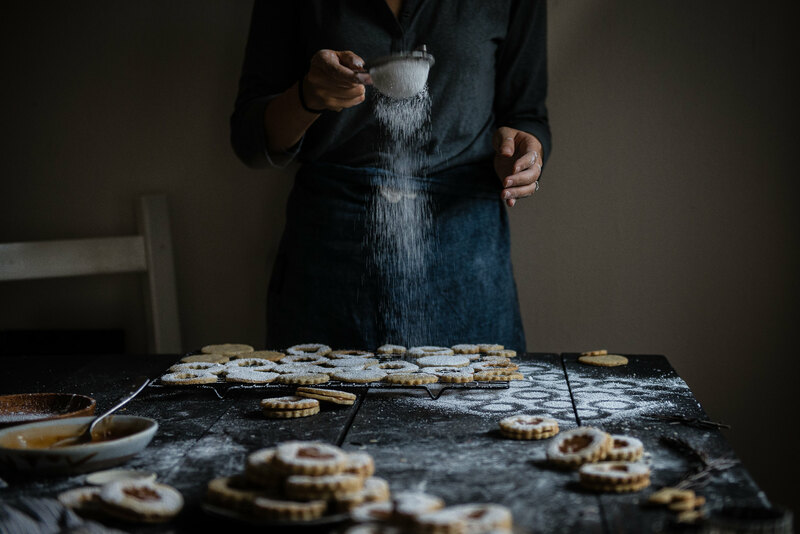 If powdering the lids, arrange the lids (or all the cookies, if you prefer) on a baking rack with a tray or paper underneath to catch the excess sugar. Sift powdered sugar over top as desired. Working quickly, while the caramel is still soft, drop about a teaspoon of caramel onto each of the bottoms of the cookies, then place a lid on top and press gently to seal. Sprinkle a bit of flaky salt over top if you like. Enjoy once the caramel is cool. Cookies will keep for a week in an airtight container and freeze for up to 3 months. « korean soy-braised beef (jangjorim) // a staub giveaway! These look wonderfully delicious – and I am dying for that rosemary and caramel filling. Yum! Mine too!!! 🙂 Thanks so much, June! I love knowing my neighbors! I love in suburb town so we are all very supportive and I bring my sweets and dishes over when ever I can just because it is nice. I would love for you to trade with me a few of this biscuits this holiday season. Simply gorgeous! Aw, I LOVE the sound of that!! I’m definitely loving this new state of affairs 🙂 and yes! Swapping cookies with you would make things even better. 🙂 Thank you so much, Belinda! I don’t know if you can claim that many exclamation points – I’m pretty sure I’ve contributed more than my fair share! 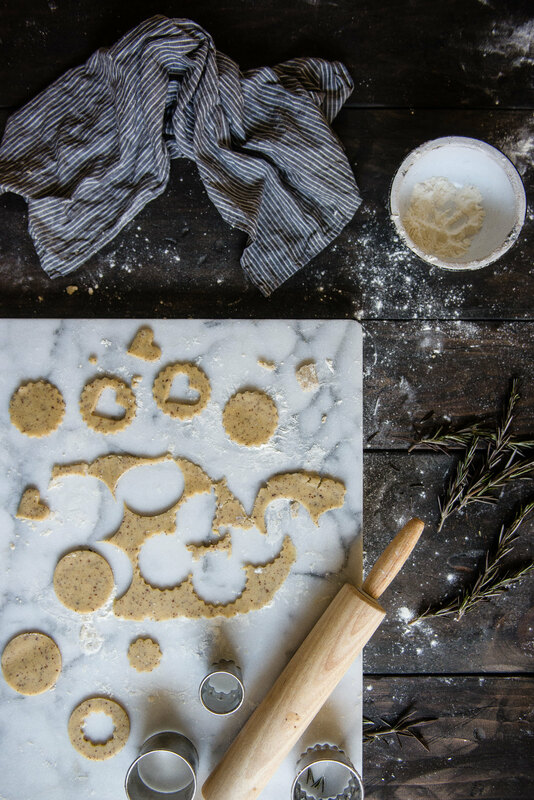 In fact, these cookies make me want to exclaim – what a stunning combination of herbacious rosemary and sweet-and-salty caramel! Perfection. I’m totally in love with these cookies (I was just looking at your rosemary, white chocolate and almond cookies earlier today!). The combination of rosemary with the caramel is just magical. Can’t wait to make these asap! Bah for anonymity!! I definitely feel you on that… I think every other building I’ve ever lived in has been that way. If I were your neighbor I’d be knocking on your door for those pistachio chocolate cookies day and night!! Thank you so much for the sweet words!! I know, it’s funny how I can never get enough of rosemary in sweet applications.. just so weirdly savory yet delicious 😉 hope you’re having a wonderful holiday season, Kathryn! Hahaha!! At my old place you could see right in the windows if the shades were pulled back, and we definitely had people gawking at me from the sidewalk when I was on a stepstool taking pictures of food on the windowsill — LOL. If we were neighbors we could do a joint photoshoot and it’d be so much fun. 😉 Thank you so much for the sweet words, Ileana!! These cookies look and sound amazing for my holiday treat tray! I don’t see the rosemary listed in the ingrediant list. Can’t wait to make these! Hi Sharon!! I’m so sorry! It’s 1/2 tsp finely chopped rosemary, to be whisked with the egg. I’ve updated the ingredients list and it should list it now. Thank you so much for letting me know and thank you for such kind words!!!! I hope you love them if you try them. I have no idea who my neighbors are which is a real shame there seems to be a high turnover of residents. But I bet if I made them some of these cute little cookies Id soon have neighbor friends, they look super lovely. These look fantastic! I love the flavor combination here!! Beautiful!! Rosemary and caramel. I’m sitting in front of my computer literally salivating at the thought of this flavor combination. Happy holidays! These are so beautiful. I’m so making alfajores next week and will totally use elements of these. I can’t imagine friendly neighbors. I feel like they know too much because they see and hear everything. 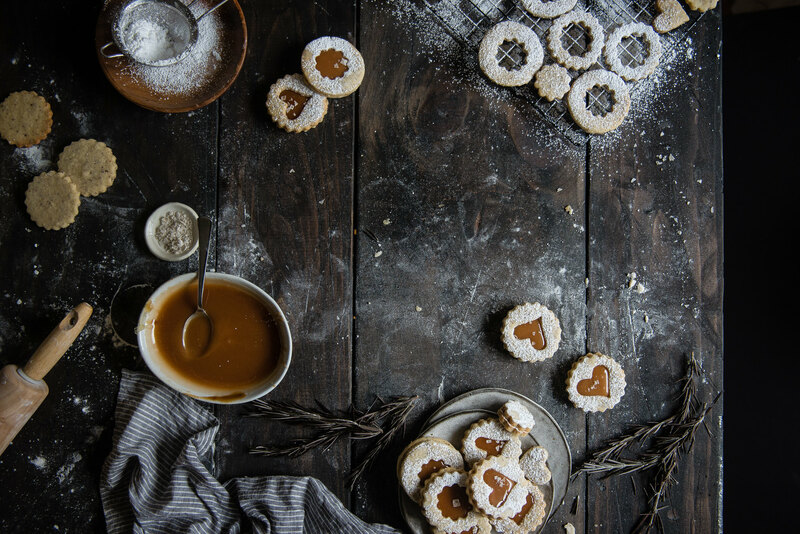 Linzer cookies are some of my very favorite Christmas cookies and yours look phenomenal! Love your take on them with the rosemary as well as the salted caramel instead of jam. These pictures are so festive and cozy and powdered sugar is just the queen of every holiday baking pic, isn’t it? Also, yay to neighborliness! Those brunches sound like lots of fun, and I’m sure you’re the most favorite person as you always make sure to bring something delicious with you. Thanks for the link love <3 You're the sweetest. I think I’m about to become obsessed with caramel and rosemary, whoa! I would have never thought to put those two together, but it sounds amazing. And in a linzer cookie, just stop 😉 I love the mysteriously absent neighbors because then you can make up their stories with your significant other, ha. I always love to see what you come up with here, as it’s always so pretty and creative! I’m getting really excited for the holidays too, looking for various ideas for baking and menu-planning our Christmas brunch and dinner parties. These cookies would make such a lovely addition, or gift! My daughter and I made Linzer cookies over the weekend.. I have to say yours totally blow ours outta the water tho. LOL!.. It is good to know your neighbors and have that since of community. Your community sounds awesome. You should totally do a post of one of the brunches! Linzer cookies always make me think of Sarabeth's, for whatever reason. Maybe because I found out about these cookies in her book. I'd love to try making them, since I can't find them here (or I could take a trip to Austria, but that's for another time). Rosemary pairs so well with sweet stuff! Ever since I discovered how well it pairs with chocolate I've been meaning to incorporate it in more sweet recipes. It must taste delicious with caramel, as well! How can you call this “Linzer cookies”??? Linzer cookies have 4 ingredients: flour, sugar, butter, ei. And filling is red currant jam. Thats it. These are nice cookies, but definitely not the Linzer cookies. ^^^^ ahem, rude! 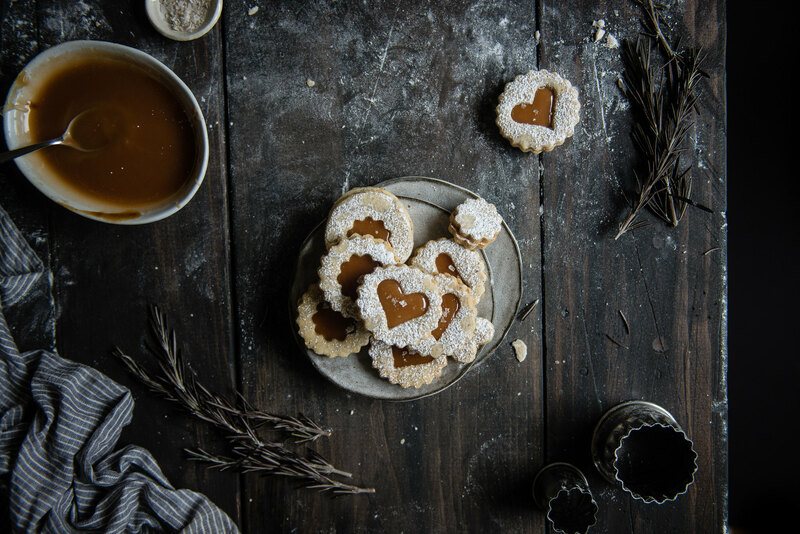 These linzer cookies are so perfectly festive! I love the combination of caramel and rosemary — so unique but totally makes sense! I live in a community similar to the one you moved from — the most interaction I’ve had with my new neighbor is being able hear him pee through the wall when it’s really quiet. hehe. I supposed I could use all of these Christmas cookies I’m pumping out to make friends — you’ve inspired me!! Brings me right back home to Austria (the nearest “town” is Linz) 😉 Also love your caramel version instead of the traditional jam! These look so beautiful, they would be perfect to hang on the Christmas tree <3 I love the idea of herbs in sweet food but I don't do it often enough! Ahhh so happy for the holidays!! Say it ain’t so Cynthia!!!! Linzer cookies, alfajores, dulce de leche, all of my favorites!!! I honestly was always kind of MEH about caramel though, until recently I made some at home with fresh ginger and now I’m in love with it! I can imagine how good these are~mmmmmm. <33 And it's awesome your neighbors are so easy going, Cynthia! 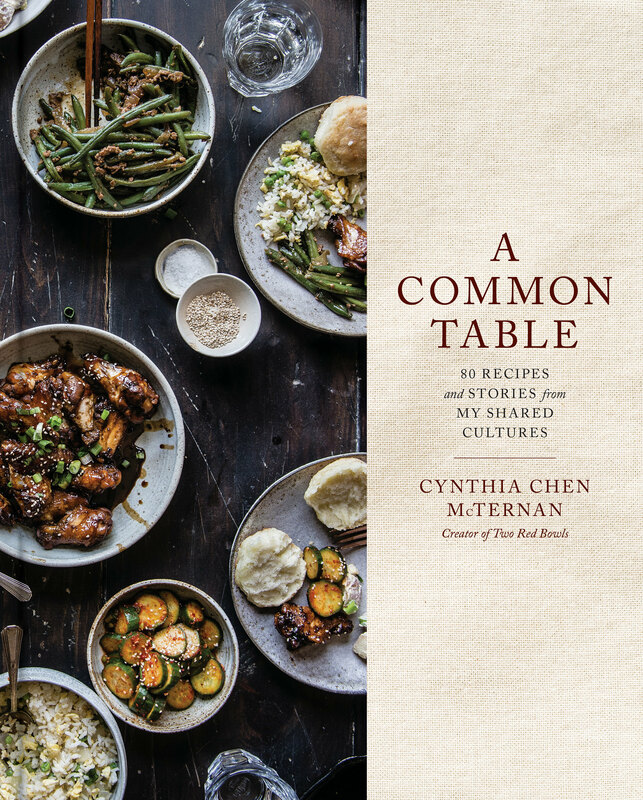 Nowadays it's so hard to find that community of hospitality–especially in certain cities like LA. i was swept over with holiday cheer scrolling through this post. these cookies are just so delicate and beautiful, and your photos make my eyes so extremely happy – totally perfect. i have a special place in my heart for Linzers, as i thought (very selfishly) they were named after me when i was a kid. i love your take on them here with the caramel and rosemary – seriously, what’s more perfect than that!? sending you big hugs and lots of festive cheer! xo, friend. LOVE all the Christmas cheer, you are putting a smile on my face. Wishing you could be my neighbor right about now…these cookies look so good! And thanks for the shout out. So excited you like my beignets. But really, I think Molly’s gingerbread village today takes the cake! Can I be your neighbor?? Because that sounds magical. Though we do have great neighbors, too, and they know my addiction to Amazon Prime all too well. 😉 Heart these cookies big time! These look CRAZY good! Not to mention the addition of rosemary! I reckon everyone would like (love, really) to be your neighbor. I thought the neighbour-bake exchange was just in fiction too, until the day my neighbour came over asking for eggs and the like. Ohmygahd I can’t take this any longer – simply breathtaking! Merry Christmas Cynthia! These cookies are perfection!!! I’m into rosemary in baked goods and sweet things, so I hope I can find a moment to make these before the winter baking season is over. Not that I need a “baking season” to be baking … duh. Love it! If we were neighbors we would brunch always. I just realized that every time I come here, I hold my breath while I look through your photos. At the end of the post, it all comes out. It’s like all my faculties are focused on absorbing your beautiful images. So love, Cynthia, as always. Your neighbors won the lottery. HOLY. COW. Too freaking beautiful for words. You are a GODDESS, Cynthia!!!!!!!! I agree that knowing neighbors for the sake of pawning your baked experiments off on them is suuuper nice (nice for my expanding waistline too;). Brunch without shoes sounds awesome too. 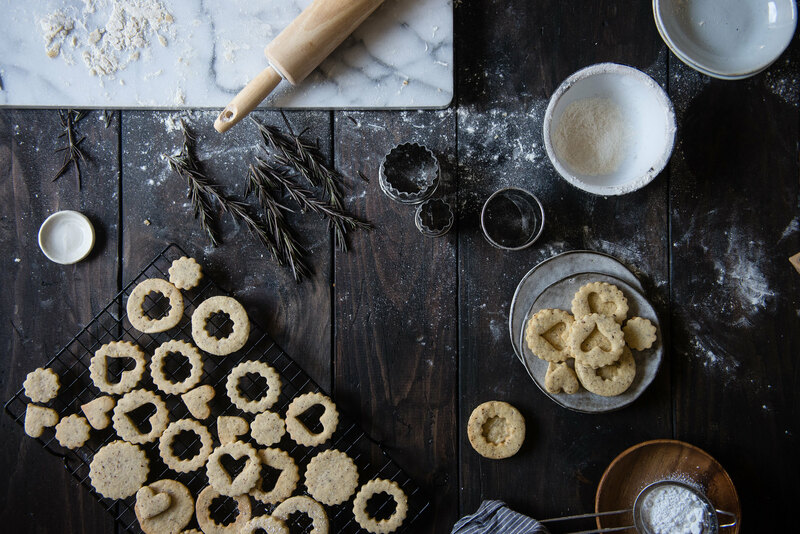 I love how you’ve been incorporating spices I traditionally think of as savory into sweet decadent desserts – thyme marshmallows and now rosemary cookies! You are brilliant. (And I want to be your neighbor). These look gorgeous! I’ve been looking for a baked good recipe with rosemary to use in little office Christmas treats I’m putting together. I can’t wait to try these out this weekend! Your blog is amazing! I am sure you hear that a lot, but seriously you have such beautiful food + words on here. Over the summer, I had the neighbors borrowing stuff experience + sitting on stoops with their kids. It’s super cute and comforty!! 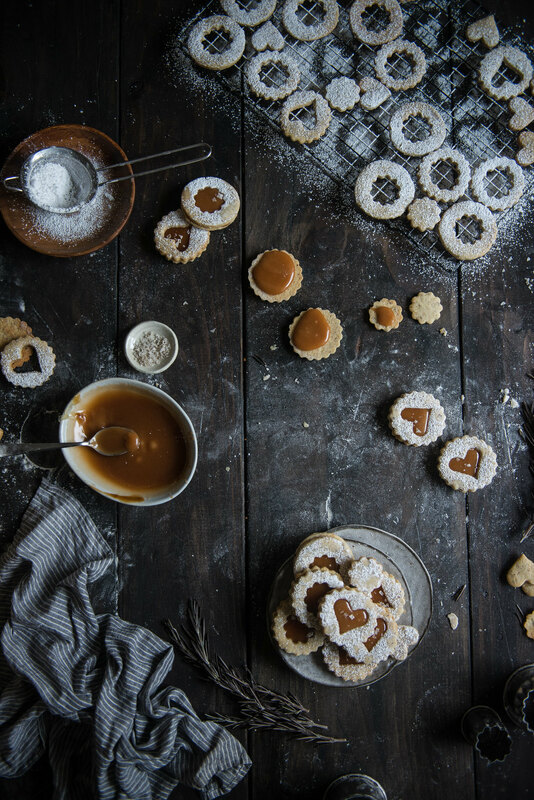 These linzers look amazing, the salted caramel sounds so good. I am definitely going to have to try this out. Sounds like you found the perfect building with the perfect neighbours!! Lucky you!! 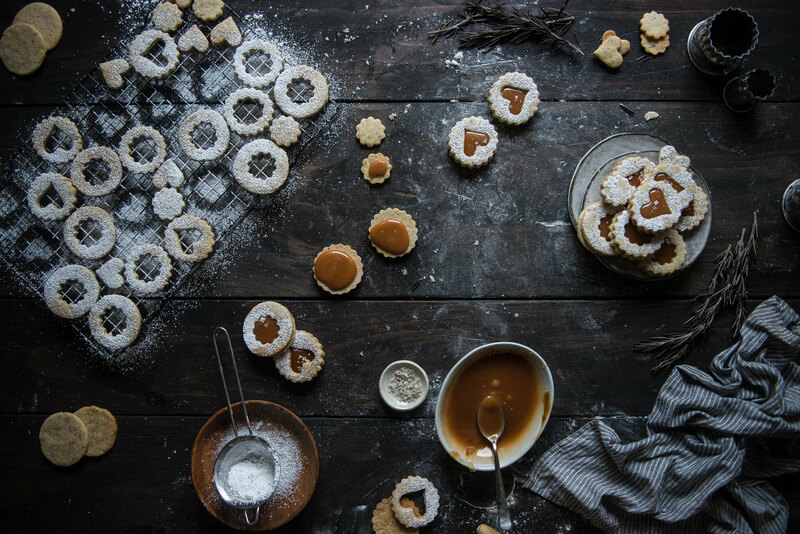 I love this twist on the linzer cookie! The combination of piney rosemary with creamy caramel sounds exquisite! I’m all about rosemary-infused sugary things! These hybrid linz-ajores are genius. I just made two batches of these cookies for Valentine’s Day 2017. The first batch I followed the cookie directions and they turned out great and I used store-bought caramel in a jar. The second batch I tried to make the home made caramel which was not a huge success. I wish there were more detailed instructions. About how long should the sugar/water mixture simmer? Mine was simmering so long that the sugar re-crystalized and it never turned golden. So I added more water and stirred again and it still didn’t work. I decided to finish the caramel following the directions anyway. It tasted fine but the consistency was off. More hand-holding instructions for the caramel would be great, or a picture of what color brown it should be. The rosemary is so refreshing in the cookies! Also, a fun surprise, I teach English in South Korea and one of the sister-cities of our city, Gwangyang, is Linz, Austria! So these cookies were perfect for my first day teaching English to our city hall employees. Thank you for this recipe! Hi Mary, I’m so glad that the cookies turned out for you but so sorry you had trouble with the caramel! The directions in the recipe (near the end) link to a GIF tutorial by Izy Hossack that I found incredibly helpful and that shows in GIFs exactly what you should be looking for at each step. Here it is again: http://www.topwithcinnamon.com/2012/11/how-to-make-salted-caramel-a-step-by-step-guide-with-gifs.html I find caramel super finicky (and needed ALL the hand-holding my first time making it) so I totally sympathize with the need for more detail. I will try to edit mine for clarity next time I make it. Thank you for the feedback and for trying them! I absolutely love the idea of these cookies, and I’m dying to try them. But I can only find almond flour. Would that work in this recipe? Hi Annalisse, I’m not 100% sure, but will hazard a guess that that would work just fine. Almond flour might be a little more finely-ground than other nut meals, but often it’s almost identical to almond meal. Please let me know how it works out if you try it, and fingers crossed! It went wonderfully! My new fav and so pretty! The caramel is just a great pairing, and the almond is subtle but there. Thank you for the recipe. Hurray, that makes my day!!! Thank you for reporting back and I’m so thrilled you liked the cookies. One of my favorites, too.